Monarch Air Group provides private air charter in Madison, WI. Our clients benefit from top-notch service, unrelenting dedication to safety, wide selection of aircraft, and years of experience in chartering private jets. To obtain a free quote, please use our online quoting tool provided below, or call toll free 1-877-281-3051. Monarch Air Group provides private jet charter flights in and out of Madison, Wisconsin, USA. 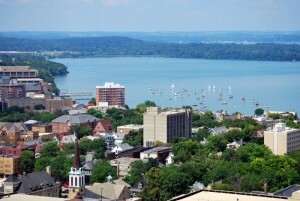 The city of Madison is situated in the south central part of the state on the isthmus between Lake Monona and Lake Mendota. Located among the 5 glacier-created lakes, Madison is a vibrant beautiful small city that offers many outdoor activities, environments, and beautiful views with over 200 parks and lakes including Mendota, Monona, Yellowstone, Wingra and Blackhawk. Madison downtown features an impressive domed edifice – the State Capitol, and the beautiful skyline of the commerce, government, education and culture. The most popular attractions include the Monona Terrace, the Governor’s Mansion, the Olbrich Botanical Gardens, the Wisconsin Veterans Museum, and the State Street. 1. ETB, West Bend, West Bend, United States. 2. FEP, Albertus, Freeport, United States. 3. FLD, Fond Du Lac, Fond Du Lac, United States. 4. JVL, Rock County, Janesville, United States. 5. LNR, Tri County, Lone Rock, United States. 6. MSN, Dane County Regional, Madison, United States. 7. MWC, Lawrence J Timmerman, Milwaukee, United States. 8. RFD, Greater Rockford Airport, Rockford, United States. 9. UES, Waukesha, Waukesha, United States. 10. UNU, Dodge County, Juneau, WI, United States. 11. XES, Municipal, Lake Geneva, United States. 12. ZRF, Park & Ride Bus Svc, Rockford, United States. 1. DoubleTree by Hilton Hotel Madison, 525 West Johnson Street, Madison. 2. Hotel Ruby Marie, 524 East Wilson Street, Madison. 3. The Wisconsin Union Hotel-Madison, 1308 West Dayton Street, Madison. 4. Washington Hotel Coffee Room, 402 West Lakeside Street, Madison. 5. DoubleTree by Hilton Hotel Madison, 525 West Johnson Street, Madison. 6. Madison Concourse Hotel and Governor’s Club, 1 West Dayton Street, Madison. 7. The Edgewater Hotel, 666 Wisconsin Avenue, Madison. 8. Hotel Ruby Marie, 524 East Wilson Street, Madison. 9. Sheraton Madison Hotel, 706 John Nolen Dr Service Road, Madison. 10. Best Western Plus Inntowner & the Highland Club, University Avenue, Madison.